How to play PowerPoint on DVD player ? How to burn PowerPoint to DVD with music ? How to convert PowerPoint 2007 to DVD? How to create DVD from PowerPoint ? How to Convert PPS to DVD? "How can i play PowerPoint presentation on TV? – How to play PowerPoint on TV? I wanna share them with all my friends in the party." – by Jason c on Yahoo Answers. Questions like "Can you play PowerPoint on TV" or "how to play a PowerPoint on a TV" are not rare. For business affairs, we usually play PowerPoint presentations on projectors other than play PowerPoint on TV. However, sometimes the projector is replaced with a large monitor or TV, like having party at home. Therefore, how to play a PowerPoint presentation on a TV has become a big concern. If you happen to have the same question as above ones, don’t worry. You could learn different ways on how to play PowerPoint slideshow on TV to present your slideshows smoothly on TV. The below methods are all effective ones to help you view PowerPoint on TV, some of which are even free of charge. Carefully check your computer and then you will find that your computer would get an HDMI port. If you have an HDMI cable, it would be the easiest way for you to play PowerPoint on TV. The below demo would show you how to connect laptop to TV with HDMI cable so as to let you play PowerPoint on TV freely. Plug in your HDMI cable into your laptop’s HDMI Port. Connect the other end of the HDMI cable to your TV’s HDMI port. Usually, there are two HDMI ports on your TV, one located on the side and the other behind the TV. Switch to ‘HDMI‘ from your TV’s Remote. Usually, this option is available from the remote’s Menu button. You might have options like ‘HDMI 1′ and ‘HDMI 2′ appearing on-screen. This is because one of the menu options connects to your first port and the other to the second. The port numbers might be labeled differently depending upon your TV’s model. After that, play PowerPoint presentation on your laptop. The HDMI cable would start to play PowerPoint on TV at the same time, just like mirroring. Nowadays, many mobile devices like Android and iPad tablets also support HDMI to TV connectivity. Therefore, you could try to play PowerPoint on TV via HDMI cable from your mobile devices as well. Besides using HDMI cable to connect your laptop to TV to play PowerPoint on TV, another effective solution is to save PowerPoint to video and then transfer the saved PowerPoint video to USB. What you need to do then is insert the USB into the USB port of your TV and then play PowerPoint on TV from the local drive. There are a lot of methods to save PowerPoint to video. I would like to recommend you the best solution to save PowerPoint to video – Leawo PowerPoint to Video Pro, a professional 3rd-party PowerPoint to video converter app to help you convert and save PowerPoint presentations to video in different formats without any loss. 1. 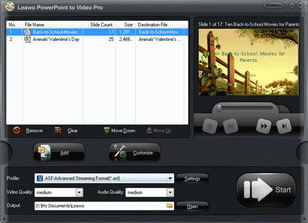 Convert PPT to video/audio in 180+ formats, including: AVI, FLV, MPEG, MP4, TS, MOV, WMV, VOB, MKV, MP3, AAC, AC3, WAV, etc. 2. Support any PowerPiont: PPT, PPTX, PPTM, PPS, PPSX, POT, POTX, POTM etc. in PowerPoint 2000/2002/2003/2007/2010/2013. 3. PowerPoint editor: set PPT transition time, insert background music, set audio effect, set aspect ratio, add watermark, etc. Firstly, they support to save PowerPoint to video in only a few formats like MP4, WMV, AVI, etc., while you can use Leawo PowerPoint to Video Pro to save and convert PowerPoint to video in 180+ formats. Secondly, Leawo PowerPoint to Video Pro supports batch conversion for converting PowerPoint to videos, while Microsoft PowerPoint and online PowerPoint to video converters couldn’t. Leawo PowerPoint to Video Pro retains all elements in source PowerPoint presentations like animation, narration, etc., while others may loss some. Leawo PowerPoint to Video Pro features wonderful bonus features other than simple converting, like internal video editor, PPT player, etc. Download and install Leawo PowerPoint to Video Pro on your computer, then launch it. Click the "Add" button to browse and add your PowerPoint presentations into this PowerPoint to video converter. You could add multiple PPT files for batch conversion. After loading, click the "Output" box to set an output directory. Then, click the "Profile" drop-down box to set output format. You could select from "Common Video" group, or determine an output format from preset devices. Finally, click the "Convert" button at the bottom right corner to start creating video from PowerPoint files within Leawo PowerPoint to Video Pro. After converting, transfer the converted PowerPoint files to USB. Then insert USB to the USB cable of your TV. What you need to do then is play PowerPoint video on TV from the USB drive. If you have a DVD player, you could play PowerPoint on TV with DVD player by converting and burning PowerPoint to DVD disc. While this method is more laborious than the aforementioned, it is a pretty functional method. What you need to prepare include: PowerPoint to DVD burner software, DVD recorder drive (most computers would have already), blank writable DVD disc, and your DVD player at work. As to PowerPoint to DVD burner software, Leawo PowerPoint to DVD Pro works excellent. It is a master program that helps you burn PowerPoint to DVD/Blu-ray movie for enjoying on TV or projector with DVD/Blu-ray player. Actually, it’s far more than a simple PowerPoint to DVD burner, it’s also a PowerPoint to video converter that could convert PowerPoint presentations to videos in different formats. ☉ Burn PowerPoint to DVD/Blu-ray disc, folder and/or ISO file. 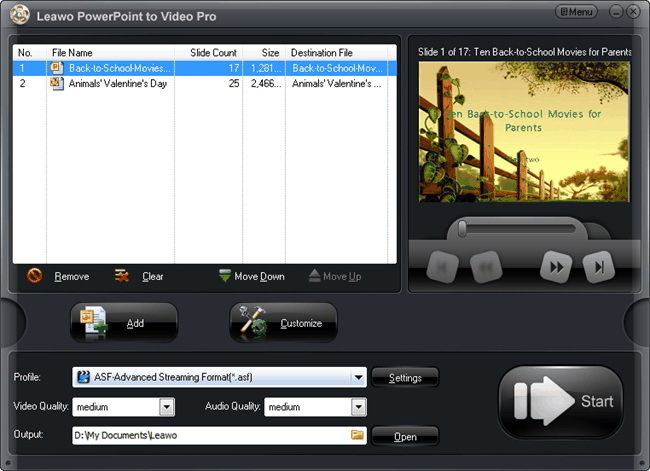 ☉ Convert PowerPoint to video and audio in 180+ formats. ☉ Add and design disc menu for PowerPoint to DVD/Blu-ray burning. Download and install Leawo PowerPoint to DVD Pro on your computer. Then launch it. Insert a blank writable DVD disc into the DVD recorder drive. Click the "Import" button to browse and add your PowerPoint presentations. Click the "Options" button to set to "Create Standard DVD". Then set the "DVD Options": choose TV standard from PAL and NTSC, set "Mode" and "Aspect ratio". Set the "Folder" options. Choose DVD recorder drive as "Output Folder". You could even click the "Advanced Settings" on the "Options" panel to do more settings, like: enable disc menu, etc. Click the "Menu" button to add disc menu to output PowerPoint DVD disc. You could edit disc menu as you like. If you like, you could click the "Music" and "Logo" options to add background music and personal signature. Finally, click the "Burn" button and then hit the the "Start" button to burn PowerPoint to DVD disc. When the burning process is finished, eject DVD disc from the drive and then insert it to your DVD player. You could then view PowerPoint on TV via DVD disc. This method is a little bit more complicated than the above 2 methods, however, it includes a PowerPoint to video converter app, which means you could use this app to convert PowerPoint to video as well. Last but not least, you can use a video streaming device like Roku 3, Apple TV or Google Chromecast to play a slideshow (e.g. one that has been converted to video format). The below image shows connectivity options for Apple TV. The various connectivity options in a video streaming device such as HDMI, USB and Wi-Fi / Ethernet provide ample scope for streaming various file types to your TV. This makes it possible to run an image, video or PPT/PPTX slideshow of your presentation slides (depending upon the mode of connectivity).